ARCOTRAD offers Consecutive, Liaison, Simultaneous and Whispered Interpretation Services. In Consecutive Interpreting, the interpreter speaks after the source-language speaker has finished speaking. The speech is divided into segments (approximately 5 minutes) and the interpreter sits beside the speaker, listening and taking notes, which allows him or her to render the speaker's message as accurately as possible. This interpretation mode is the ideal technique used at events with a small audience, such as work meetings, conferences or interviews. In Liaison Interpreting, the interpreter is no longer mediator between speaker and audience but between two or more speakers of different mother tongues. The technique used is similar to that of the consecutive. 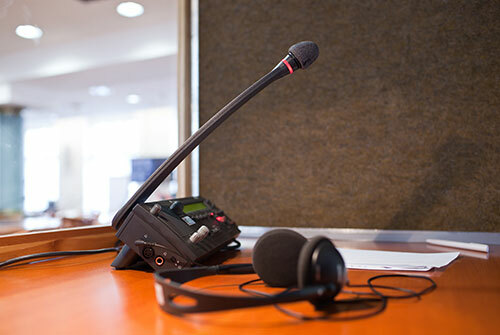 In Simultaneous interpreting, the interpreter renders the speaker's message in the target-language as quickly as possible while the source-language speaker keeps speaking. The interpreter, sitting in a sound-proof booth, hears the speaker via earphones and speaks into a microphone. The translation is transmitted to the audience via their earphones. This type of interpretation is mainly used during workshops, conventions and conferences with a vast audience and where speakers of different mother tongues take the floor. The advantage of this technique is that the speaker's speech can be translated into more than one language at the same time. Whispered interpreting (chuchotage, in French), is used when a maximum of two people require translation. The technique is the same as the simultaneous one, but no equipment is needed. The interpreter's mouth and the ear of the person listening must be in proximity so as to not disturb other people in the room.